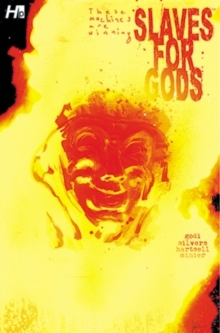 Hermes Press announces the first volume of These Machines Are Winning Presents: Slaves for Gods. This Original Graphic Novel contains the first four chapters of the story. Slaves For Gods is a post 9/11 conspiracy thriller that plays out like an 80's sci-fi adventure film. Taking place in modern day, it follows two computer programmers and an anarchist group, trying to bring down the evil corporation, Sen-Tec, and it's maniacal CEO. Additional interior art contributions by James O'barr (The Crow), Clayton Stillwell (The Book of Life), Antoine Dode (Percy Jackson, The Crow), and Sebastian Fiumara (Abe Sapien). The art collective, These Machines Are Winning, expands upon the world created in Slaves For Gods through multiple forms of media including film and music. Cover A contains a full-length digital download to the new album "Teenage LSD" (Dreamy Analog 60's Wall of Sound Psyc Pop) while Cover B contains a completely different also previously unreleased full-length digital download to the album "Slaves for Gods" (Electro-Cyber Punk, Shoe Gaze), both by These Machines Are Winning. These Machines are Winning presents: Slaves For Gods Volume One ; Cover A ISBN #978-1-61345-130-4 ; Cover B Variant ISBN #978-1-61345-131-1 ; Black And White & Color; Hardcover ; 128 pages; Slaves For Gods art by Aaron Minier ; Story by Jason Godi, Dylan Silvers and Ryan Hartsell ; Cover A by Jock and Cover B Variant (PREVIEWS EXCLUSIVE) by Charlie Adlard ; Each edition comes with a unique music digital download of a full-length album by These machines are Winning ; $19.99 each.